The inspiration behind Paul Minx's play was as a tribute to a man who worked for his family when he was a child. Known as "the gardener", he became something of a second father to Minx - far more than simply "the help". Fittingly, The Long Road South begins with a focus on the relationship between a child (Ivy - Lydea Perkins) and her family's very own "help", Andre (Cornelius Macarthy). 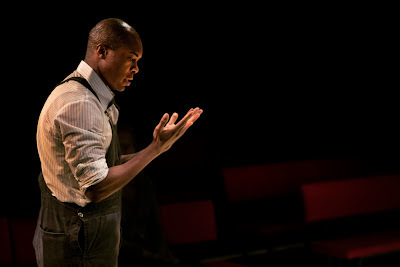 As Ivy approaches sexual maturity, Andre plays a role in her sexual awakening - he is a pious man, assisting with her bible studies, yet equally represents otherness, desire and danger. Andre, of course, would never touch her, but it's never in doubt whose side her authoritarian father Jake (Michael Brandon) would take. It makes for a volatile situation, with Andre torn between duty to his employers and duty to his people, as represented by girlfriend Grace (Krissi Bohn) who plans for the two to leave for Alabama the following day to join the civil rights movement. 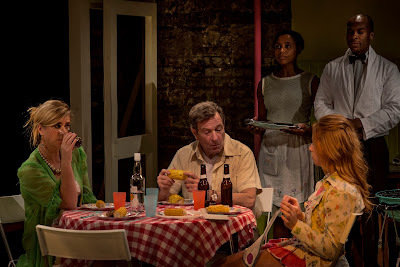 Yet whilst Minx's play might represent civil rights in microcosm, it ultimately moves in broad strokes and lacks focus, becoming a small-scale domestic drama of soap opera proportions. There is tension and conflict for sure, and the script entertains with dry humour. Yet the play lacks a sense of urgency and drive. Mostly this is down to some stereotypical characterisation, making the all too familiar narrative difficult to buy into. Macarthy offers a composed performance as Andre, but elsewhere Perkins is a stroppy petulant Ivy; Imogen Stubbs is a pantomime drunk as mother Carol; Brandon has presence as Jake but the character is simply a controlling man losing grip on his family; and Bohn's Grace is underused. It's the overly ambitious script more than the acting that lacks depth, resulting in a play that does entertain, but adds little of value to the racism conversation. Watch: The Long Road South runs at the Kings Head Theatre until 30th January.